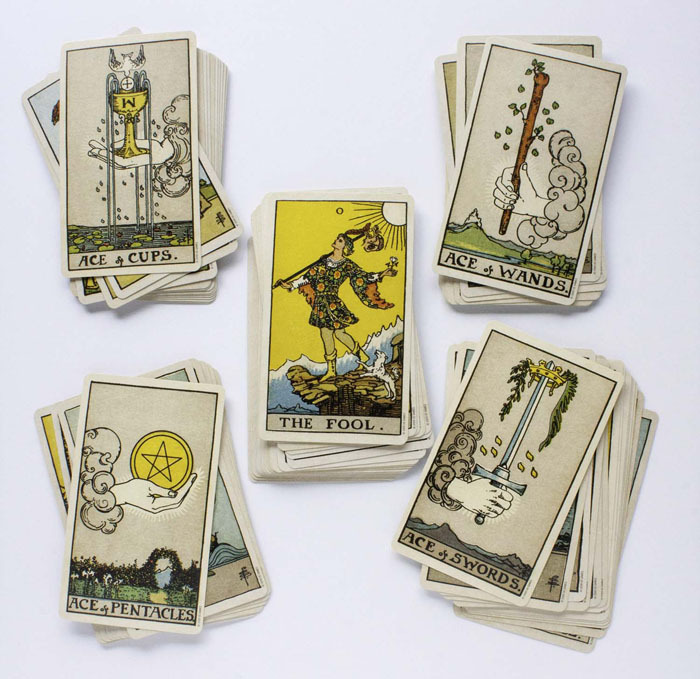 Most tarot readers and dabblers own more than one tarot deck. 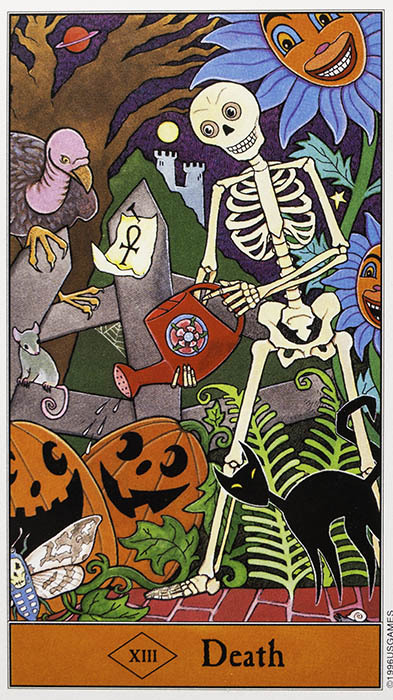 Most of us can attest that every deck has a different way of conveying messages. Each set of cards seems to have its own personality! But have you ever picked out a deck with a theme or aesthetic that you really love —yet you can’t quite make a connection to the cards when you try to read them? Rather than giving up on reading with your new tarot cards, try some bonding and connecting exercises. 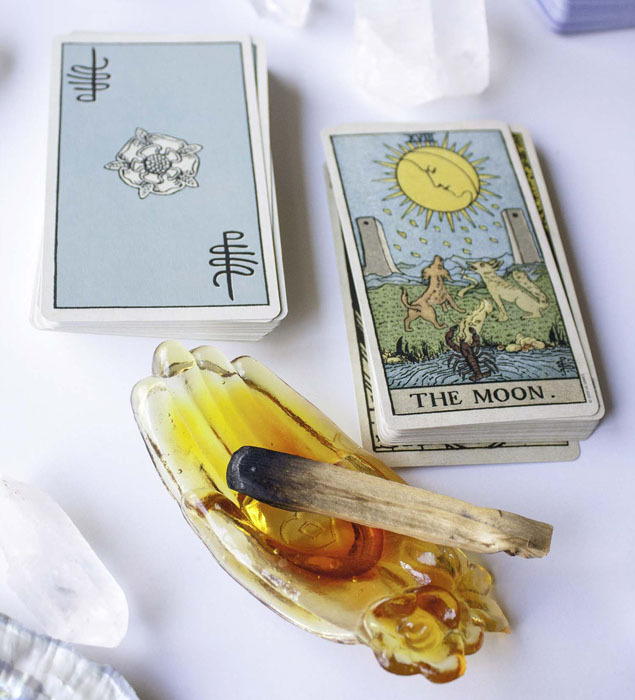 Bonding with your tarot deck is a great practice you can use, along with cleansing your cards, to attune to your new, or old, deck’s vibe for more powerful and accurate readings. This post contains affiliate links for decks and books available on Amazon. Clicking these links won’t cost you any extra money, and helps support the blog. Check out the affiliate policy here. When I get a new deck, the first I do is check each card. I’m not only taking in the imagery of the cards, but also checking for missing cards and damage (you’d be surprised how much this happens). Do the suits have a color theme? Each suite in the Ostara Tarot was created by a different artist and uses a unique color pallette. Are the suits renamed? How does that change or color the traditional card meaning for you? Are the court cards renamed? Does that bring new personality traits to them? Visually, do the suits follow elemental dignities (i.e. coins as earth, cups as water)? Do they vary from what you’re used to? Are there repeating symbols? What do they mean to the creator of the deck? What do they mean to you? What are your favorite cards in the deck? Which ones do you hate? Why is that? How are the cards different from the Rider-Waite-Smith system or another tarot system that you’re already familiar with? For all of these design elements: do they add new meanings to the cards? Sometimes not. But often these artistic differences will influence your interpretations of the cards. Visual meditations are great for both learning tarot and connecting to your deck. If there are characters in the card, imagine yourself talking to them. How would they answer: who are you? What are you doing? How did you get here? Note any answers, feelings, or images that come up. How would it feel to be in the scene depicted in the card? What is the atmosphere like? What if you were the character in the scene? Once at a tarot workshop I attended, the teacher had individuals ask a question for the tarot, draw a card, and then act out the scene in the card (including calling on extras in the crowd). 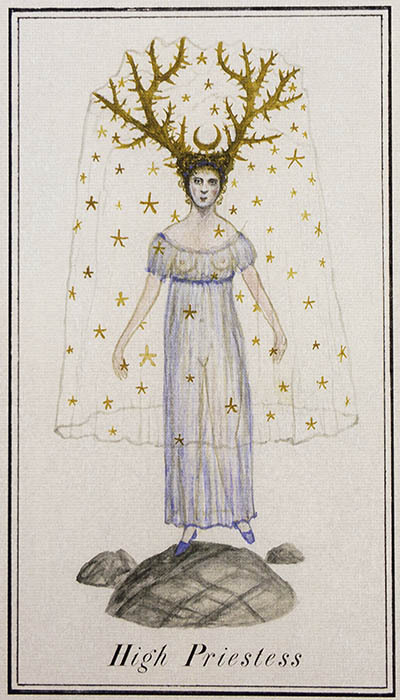 Example, for the Star card, the participant would kneel and mime collecting and pouring water. The question would be asked again, and the person acting out the scene would reflect on whether playing out the card gave them new insights —spoiler alert, it totally did! When you’re stuck on the meaning of a card, try imagining yourself acting out the scene in the card —see what new insights you receive. This is one of my favorite suggestions that’s more on the woo-woo side. 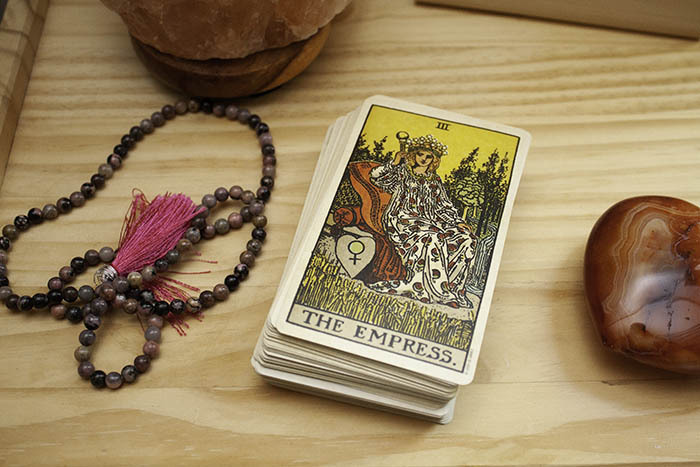 Keep your deck beside your bed on your nightstand or even under your pillow (yes, that’s real tarot folklore)! I love the idea of that the deck’s proximity to your bed would allow messages and archetypes to come through in dream imagery. The idea is that you’ll attune to the deck on a deeply subconscious level. I do keep a couple of my favorite tarot decks near my bedside for daily draws and journaling. Practically speaking: if your deck is right there next to you, you’re more likely to use it! Here’s my recommendation: flip through the cards before bed. You can either look through a few cards in the deck before sleeping or choose one card that you hope to understand better. Conversely, you could draw a tarot card before bed for reflecting on your day or pull a card for the next day. Record any insights you receive in a journal. Put your tarot deck in the hot seat —job interview style! You’ve probably heard of the classic Interview Spread. The oldest internet source I found for this spread is from StarRaven on the old Aeclectic forum. It’s since become a popular way to connect with a new deck right out of the box. What do you bring to the table — what are you here to teach me? Check out the Resources section at the bottom of the page for some examples of the Interview Spread in action. If you want to conquer learning tarot, you’ve got to ditch your dependency on the little white book (LWB for short) full of, sometimes confusing and contradictory, meanings. That being said, the book that goes with your deck can be full of interesting insights from the deck creators on obscure imagery and symbolism in the cards. Not all accompanying books are created equal. The small, fold-out LWB’s you receive in mass market decks tend to be the worst. Sometimes they’re recycled from deck to deck by the publisher and don’t always correspond to the artist’s vision of the card meaning. On the other hand, most indie decks tend to have great companion books with tons of useful insights into the personal symbolism of the deck. Most of the time, you don’t need the book to read these indie decks. But I do love to hear insights from the artists and designers. In addition to the books that come with it: keep an eye out for workbooks specific to that deck. Facebook Groups are a great way to find help for studying specific decks. Some readers consider cleansing their new cards as part of a connecting practice. I’ve previously written a big article on how to cleanse your cards. Try out some of the techniques and see if it helps to connect better with your cards. Reconnect with an old deck by sorting and reordering – this is one of my favorite methods of getting reacquainted with already shuffled decks I haven’t used in a while. When I want to pick up an old deck that I haven’t used in a while, I reorder them from major arcana to minor arcana and then reshuffle them. This process provides a great refresher on the imagery and quirks of a forgotten deck. While shuffling try connecting with your deck itself. Some readers will knock on their cards to “wake them up” and cleanse them. Connect with the feeling of the cards in your hands as you shuffle. Set the intention for your cards to reveal the message you need to receive. 8. Start Using Your Deck! Start reading with them. Use them for daily draws, ask questions, or get inspired with some tarot spreads. Once you’re getting comfortable with your new deck, try reading for friends, family, and clients. You might be surprised that a deck you’ve been lukewarm about might provide great insights in action. If you don’t yet feel comfortable reading for others with your new deck, think about keeping the cards on you during the day — test them out when you need a quick answer. 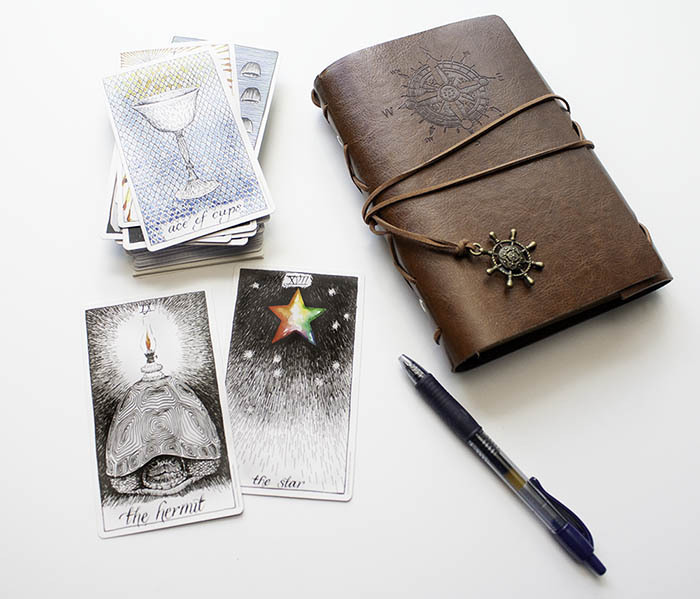 Speaking of daily practices, consider creating a tarot journal. It doesn’t have to be fancy —a spiral notebook works. There’re many tarot students who use Instagram as a daily journal to reflect on and understand the cards better. Whatever it is, pick a medium that you enjoy! If you draw a card in the morning, consider journaling more insights on the card later in the evening. For TarotLuv newsletter subscribers, I’ve got a handy daily journal worksheet you can download. Print it out and use it, or fill it in digitally!